Pork souvlaki: Put the meat and all the other ingredients in a bowl (not metal) and mix well. Cover the bowl and keep in the fridge for 12 hours, stirring once or twice. 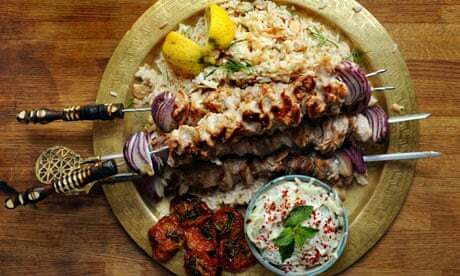 Chicken souvlaki: Blend together the yoghurt, pepper, onion and oil. Place the chicken in a bowl (not metal) and cover with the yoghurt mixture, mixing well. Cover the bowl and keep in the fridge for 12 hours, stirring once or twice. Remove from the fridge half an hour before cooking. Pass onto metallic skewers and grill for 25-30 minutes, turning frequently. Note: Each tavern has its own ‘secret’ recipe for the souvlaki marinade. These are the Zanettos ones.